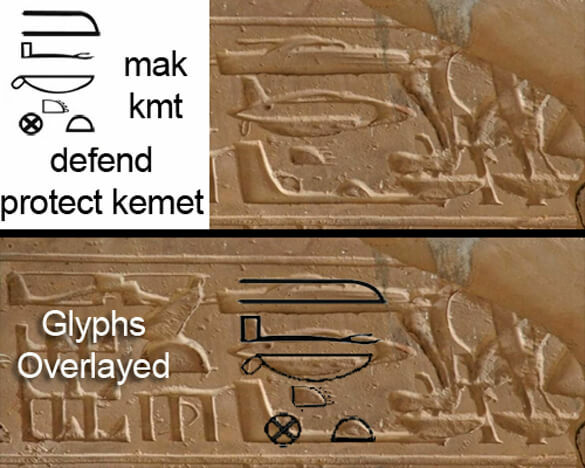 According to many UFO-logists, within the Temple of Seti I in Abydos there exists glyphs which depict highly developed crafts, specifically a helicopter, a submarine, some form of flying saucer, and a jet plane. 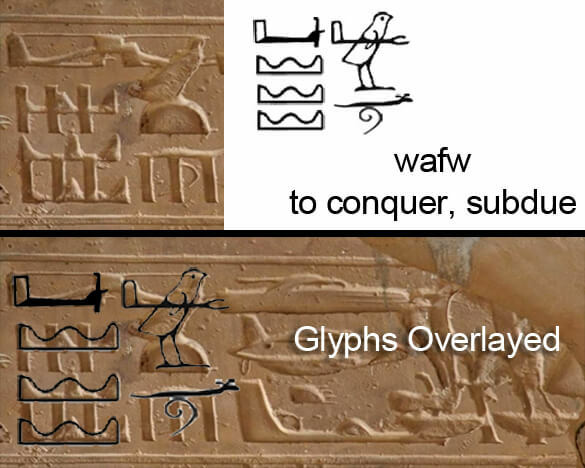 What do these hieroglyphs really represent? 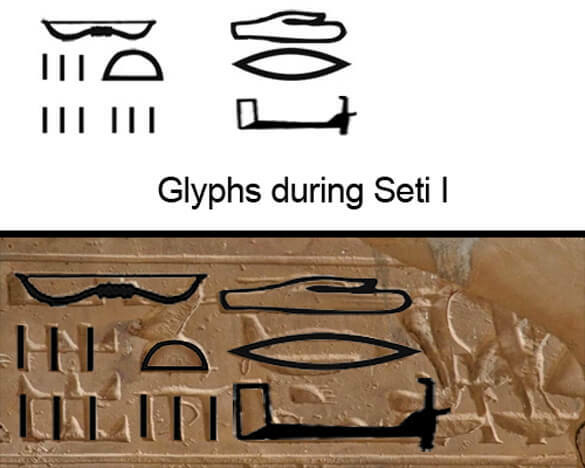 The glyphs are a result of both erosion of the stone surface (evident elsewhere in the temple) and the process of filling in and re-carving the stone to replace some of the original hieroglyphics. The technical term for such a surface that has been written on more than once is called a palimpsest. 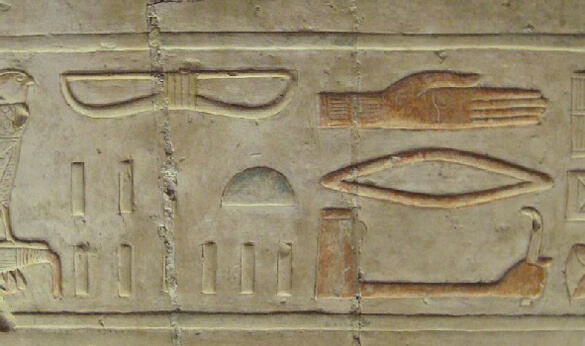 The usurping and modifying of inscriptions was common in ancient Egypt throughout its history. 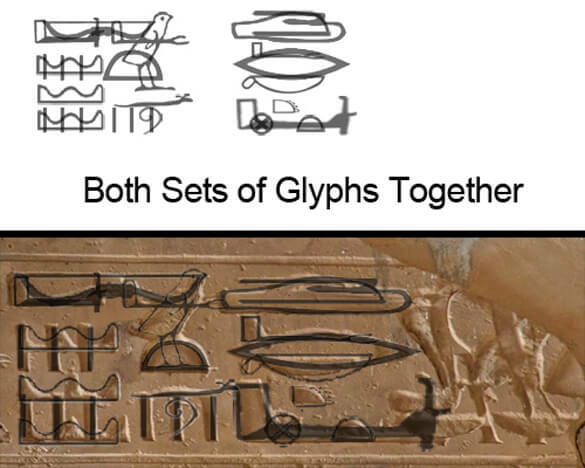 The glyph here were modified at least once in antiquity, and perhaps twice. Some of the filling has fallen out in places where the older and the newer inscriptions overlap, and the result is unique and odd-looking. 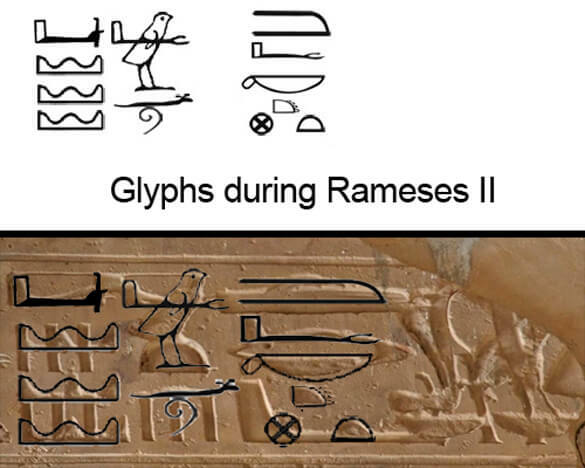 The glyphs in context (more of the entire scene). 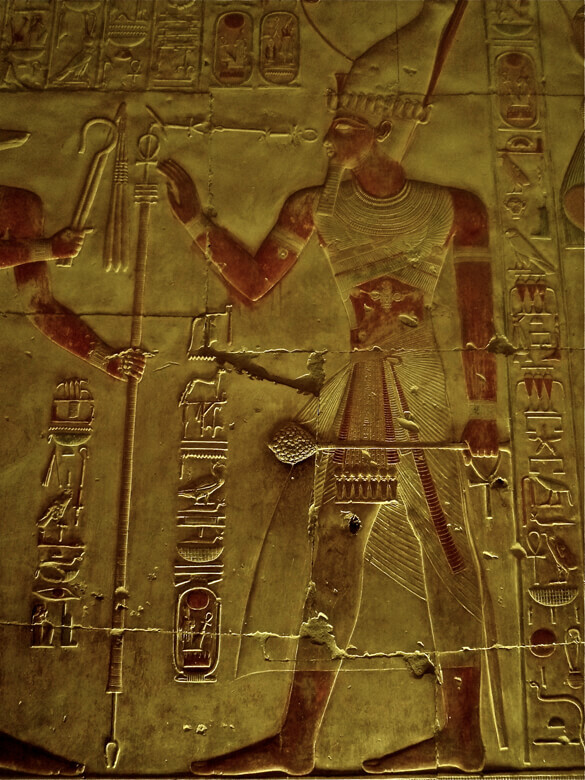 As we see in the pic above, the cartouche on the left contains the pronomen title of both Kings overlapping each other. 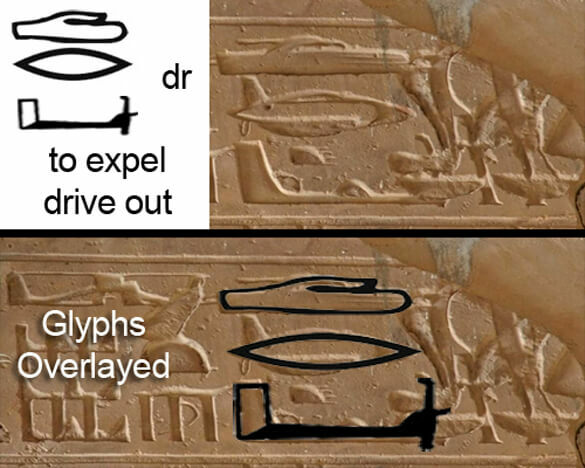 But because these overlapping glyphs do not give the appearance of anything special, they are less talked about. 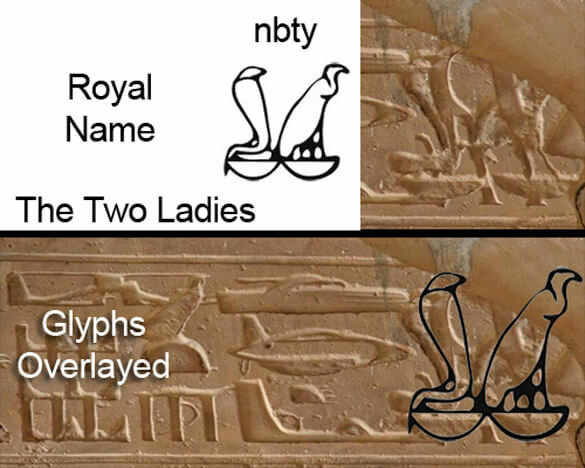 The other overlapping glyphs to the right of it, as explained in the article, are a result of overlapping as well but people’s imagination has made them out to be flying crafts instead of what they actually are -The Royal Titulary of Seti I & Rameses II overlapping each other. 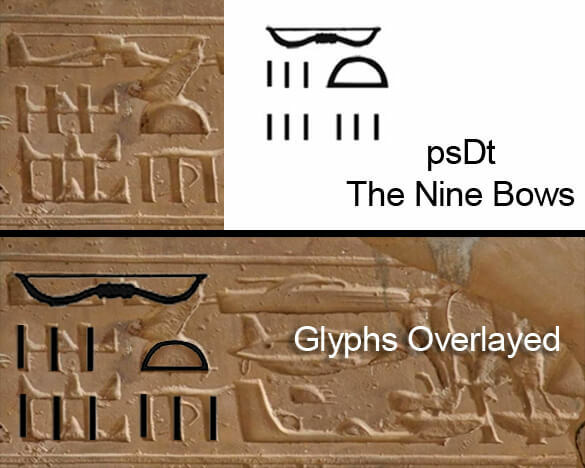 Gardiner List Numbers of the Hieroglyphs are provided so that you may look up the glyphs yourself. They are given within parenthesis for example (X1).